Avail from our all-compassing range of gloves that are made from fine fabric & exhibit all the qualities including; durability, style, design etc. Our gloves are available in various shapes, sizes & color combination. We offer these gloves at an affordable price to all our esteemed clients. 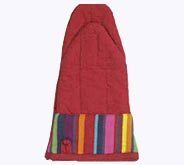 Desc : Stripe design of multiple gorgeous colors embellishes this red colored cooking glove. 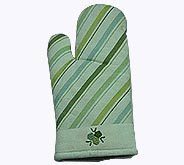 These gloves are excellent to transform daily cooking routine into a cheerful activity. 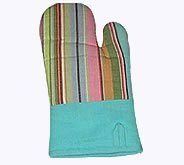 Desc : Enchantingly graced with diagonal blue, green, olive lines, these designer kitchen mittens protect the skins and nails from the hot water and dishes. Desc : Gorgeous in look as well as protective in nature. Mitten glove portrays elegant stripe lines of diverse pleasing shades and dodger blue bottom. 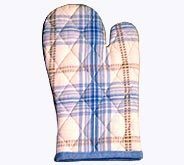 Desc : Kitchen glove with mesmerizing check pattern creates a feeling of comfort and pleasure in the kitchen with its exquisite look and high functionality. 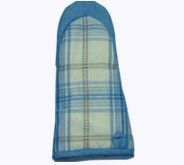 Desc : Criss cross visible stitching on white fabric and blue & brown check designs make this charming cooking mitten wonderful gift for cookery lover relatives & friends.